Holland Esquire believes the brand’s latest collection offers the “perfect, all rounded suit”. The British outfitter has unveiled its SS14 collection, accompanied by a unique lookbook. Made up of fine tweeds and exclusive patterned fabrics, the new range focuses on suits in bold hues and contrasting prints. The colours have been mixed with grey and blue tones to deliver a modern take on a traditional aesthetic. Holland Esquire’s signature details make a return from previous seasons, such as Liberty fabric pipe edge and pocket lining, distinct buttons and elbow patches. 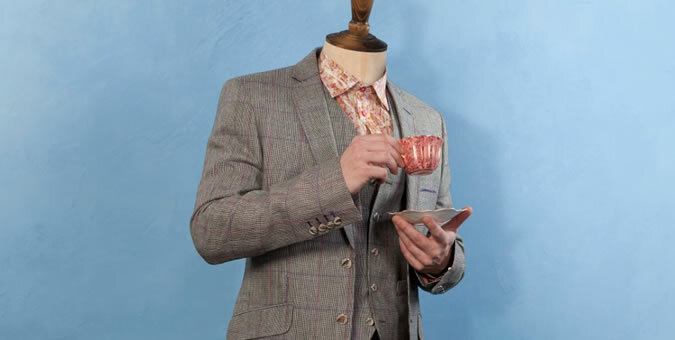 Creatives at the firm have enlisted a mannequin with human components to front the campaign. The result is an editorial that fuses tailoring and art. Many of the company’s fabrics are designed specifically for the brand. To guarantee exclusivity in design, all products are made in limited numbers. In a series of images exclusive to FashionBeans is the navy plain twill Gamekeeper jacket, of which only 250 have been made worldwide. Renowned tailor Nick Holland founded the brand in 2001. The former consultant designs and oversees every aspect of the collections. The Holland Esquire SS14 collection is available to buy from hollandesquire.com as well as at selected independent and multiple retail stores nationwide. Prices for the suits range from £125 for waistcoats, up to £445 for a jackets. Shirts and trousers both retail at around £160.